He was born in the city of Kherson in 1949. 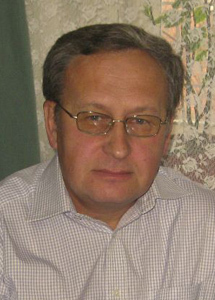 He graduated from the Kherson branch of the Odessa Technological Institute in 1971. He worked a design engineer and a leading designer. His first cartoons were published in sport press in Kiev. He is a participant and laureate of international cartoon contests in Kiev. The laureate of the Humor-86, the Smena magazine contest . His cartoons were published in the newspapers of Kherson, in the all-Union newspapers like Air Transport, Komsomolskaya Pravda, Izvestia, Inventor and rationalizer (Ukraine), Peretz, etc. He won he prize Razgrad in 1986. Since 1992 he has been published in Ukrainian press. He work with the magazines like Peretz (received an honorary diploma, 2011), Crocodile in Ukraine (the best cartoonist of 2010), Crocodile + (the best cartoonist of 2011). He is a member of the Ukrainian Association of Cartoonists.